Mexico Catches One Of Several Fugitive Former Governors After A Half-Year Hunt : The Two-Way Javier Duarte, former governor of Veracruz state, was finally apprehended in Guatemala this weekend. He's just one of nearly a dozen ex-governors either on the lam, under investigation or in prison. 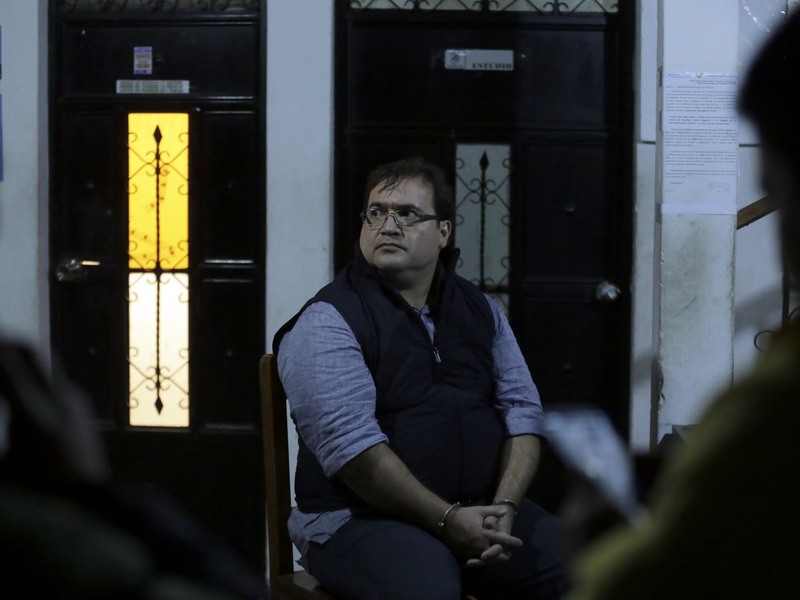 Javier Duarte, the former governor of the Mexican state of Veracruz, sits handcuffed following his arrest in Panajache, Guatemala, on Saturday. When Javier Duarte stepped down from office last October, the former governor of Mexico's Veracruz state vowed to fight the mounting corruption allegations that unraveled his tenure. "The circumstances created by false accusations ... force me to dedicate myself full-time to clear my name and that of my family," Duarte said on Oct. 13, according to The Yucatan Times, just one day after he ended his term six weeks early. It would be another half-year before the he surfaced — this time in handcuffs, escorted from his hotel at a lakeside resort in Guatemala on Saturday night. Authorities say he had been squirreled away in a hotel room with his wife, attempting to pass as a tourist. Now he is in a prison cell in Guatemala City, awaiting his widely expected extradition back to Mexico, where Reuters reports he'll face allegations that he diverted public funds for his personal enrichment. That includes a luxury ranch — packed with paintings by masters such as Joan Miro and Leonora Carrington, the BBC reports — that authorities say was paid for by siphoned dollars. During his roughly six years in office, Duarte's Gulf Coast state also earned the inglorious distinction of becoming "one of the world's most lethal regions for the press," according to the Committee to Protect Journalists. The CPJ estimated last year that at least 12 journalists were murdered during Duarte's tenure; other organizations have placed that number even higher. "Veracruz is a beautiful, long, thin state on the Gulf coast of Mexico where many journalists are terrified not only of the rampant organized crime groups that kill and control, but also of the state government. Fear that state officials will order them murdered for what they investigate or write has forced about a dozen journalists to flee the state, claiming that fear also puts a clamp on coverage for those who remain." And that's not to mention the mass grave discovered outside Veracruz city last month that contained 252 bodies, many of which are believed to have been buried years ago. Strikingly, Duarte's allegation-plagued tenure was by no means uncommon. The politician isn't the only former Mexican governor to draw prosecutors' attention — nor was he the only former leader in his own party, the ruling Institutional Revolutionary Party, to go on the lam for an extended period. 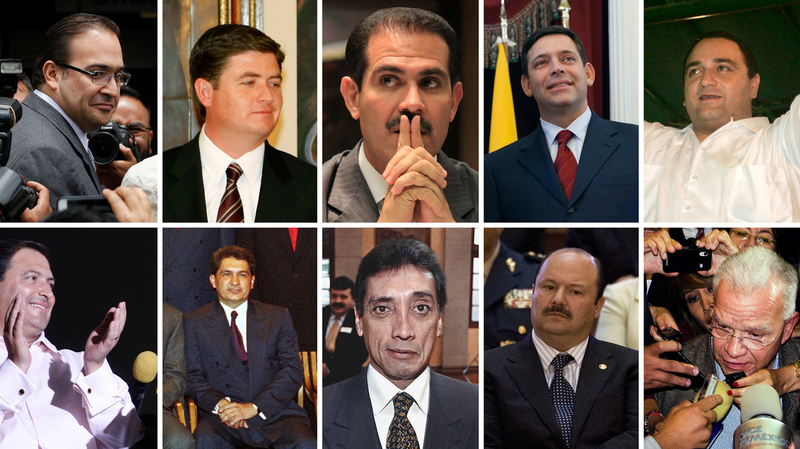 Top row: Veracruz's Javier Duarte, Nuevo Leon's Rodrigo Medina, Sonora's Guillermo Padres, Tamaulipas' Eugenio Hernandez Flores, Quintana Roo's Roberto Borge. Bottom row: Aguascalientes' Armando Reynoso, Tamaulipas' Tomas Yarrington, Quintana Roo's Mario Villanueva, Chihuahua's Cesar Duarte, Tabasco's Andres Granier. Former Tamaulipas Gov. Tomás Yarrington was caught in Florence, Italy, just last week after five years on the run. U.S. prosecutors have alleged he "accepted millions of dollars in drug cartel bribes and invested it in Texas real estate," according to The Associated Press. And The Wall Street Journal, citing orders issued by state police, says that Yarrington had been assigned eight law enforcement officers as bodyguards as late as last year. Meanwhile former Chihuahua Gov. Cesar Duarte — no relation — has still eluded authorities after he stepped down last year. Once a rising star in the PRI like Javier Duarte (who was suspended from the party around the time of his disappearance) and Yarrington, Cesar Duarte is being pursued over embezzlement charges. All of this makes for a rather persistent problem for the party's leader, Mexican President Enrique Peña Nieto, who has been battling historically terrible approval ratings. So it's not too much of a surprise that, as the AP reports, the PRI cheered the capture of the former Veracruz governor, who the party said should "be punished in an exemplary fashion, as well as anyone who is confirmed to have taken part in his criminal ring." Still, it will do little to erase the rather unexemplary records of many governors across Mexico — and not just those in the PRI. The Duartes have plenty of company. The Los Angeles Times breaks it down: In a country of 31 states and one federal district, nearly a dozen governors recently out of office are on the lam, under investigation or already in prison.